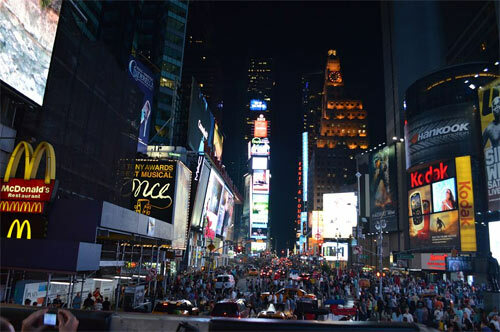 New Year in New York - Be on Times Square when the clock strikes 12. 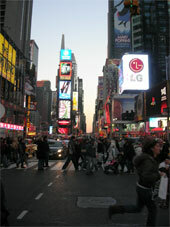 Soon it´s a new year again and the celebrations will of course be located at Times Square as usual. The music will be playing and the pyrotechnics will explode and the confetti will rain down on Times Square. Everyone will wave their balloons when the celebration for the new year starts. The light bulbs on the New Year's Eve Ball are turned off as the numerals of the New Year "2018" burst to life shining high above Times Square. Be there early - the Police will be closing streets! Depending on the pressure from the crowds and when the number of visitors arriving the police will start closing streets for cars and pedestrians. The streets around Times Square can be closed as early as 3 pm. They usually start closing at 42nd Street and then continues further north as more people comes. 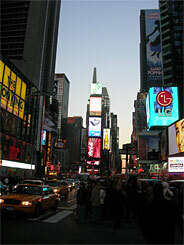 They usually recommend entering from Sixth Avenue and Eight Avenue to see the "spectacle" at Times Square. Depending on the wheather of course, dress warm and bring your own drink (non-alcoholic). Disabled viewing is available on the northwest side of 43rd Street but get there early as it usually fills up quickly as well. The visitors are recommended to arrive as "early" as possible... the sooner the better, to get a good spot to stand. At approx. 3:00 p.m, the Bow Tie of Times Square (42nd to 47th Sts. Between Broadway & 7th Ave) is fully closed to traffic. The festivities in Times Square starts. 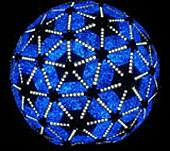 The New Year's ball is lit and raised up to the top of One Times Square accompanied by special pyrotechnic effects. One Time Square is the iconic skyscraper you can not miss when you're in Times Square, the building with all the neon lights and at the bottom you have the news rolling. Shortly after 6 pm hats and balloons are given to the audience. These will be used to celebrate the new year, waving with balloons and confetti. It is the Times Square Alliance, which distributes it. So look out for men and women in red uniforms that are handing out decorations! Performances and festivities going on "the Countdown Stage". Performances by Lauren Alaina, Camila Cabello, Chyno Miranda, Antonique Smith, Nick Jonas. Neil Diamond perform on the Planet Fitness Center Stage. Mariah Carey perform on the Countdown Stage. John Lennons world famous song "Imagine" is played live. Invited quest will press the Waterford crystal button that signals descent of the New Year's ball and the countdown of 60 seconds to the new year 2016. You see a small sample of the ball in the image to the right. It changes in different patterns and 2.688 pcs crystal triangles and lit by 32.256 LEDs. 12 Midnight !!!!! Happy New Year! Year 2018 will burst to life shining high above Times Square. A two-minute pyrotechnic display will bright up sky! The world-famous New Year's Eve confetti is released from rooftops of buildings throughout Times Square! Choose between New Year's party at two different Applebees at Times Square where you are close to the festivities of Times Square. The price includes buffet and open bar, champagne toast at midnight and dance. This ticket gives you access to Times Square's locked zone. You must show a ticket. Times Square begins to close early in the afternoon so read your booking confirmation how to get your "real" ticket and rules to enter the locked zone. Applebees is a restaurant chain in the United States with barbecue, burger, pasta, seafood and bar. You have to show your tickets to get through the police barriers, pick up the tickets on 31st December between 8am and 8pm, see info on your booking confirmation. The New Year celebration started for the first time in 1904. 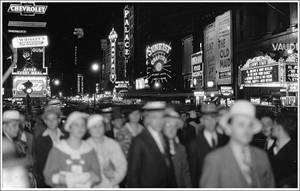 It was the same year when the city opened it´s first subway line and the invention of the neon light. It was also the same year as the new headquarters of "The New York Times" officially opened. It was the newspaper´s owner, German Jewish immigrant Alfred Ochs, who wanted to rename Longacre Square to Times Square, in honor of the famous publication. New Years Eve 1907 the "falling" ball was used for the first time at Times Square (at Broadway & 43rd Street ). It has been falling every year except for the years 1942 and 1943 when the light was forbidden to shine during the II World War. To get the best view of the ball you can stand within 43rd Street to 50th Street and at Seventh Avenue, all the way up north to 59th Street. 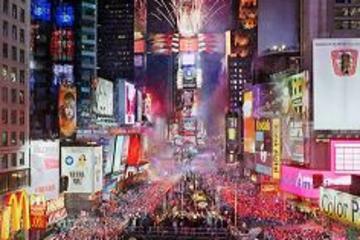 The celebration was a success and from then Times Square replaced Lower Manhattan´s Trinity Church as New York City´s place to ring in the new year. Go on New Year's Eve Party and have a view of New Year's celebration going on outside on Times Square. The party is held at the Convene Conference Center on the 22nd floor, which has windows for several directions. The party offers open-bar, hors d'oeuvres, buffet, dessert, music and dance. As the facility is located within the Times Square Security Check-Point area, you will be provided with event documentation and instructions on how to enter the Times Square area and Sentry Center. 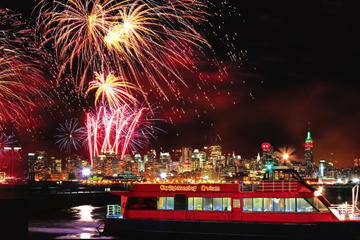 Want to go by boat and watch the fire works from the water? Book your hotel in time! 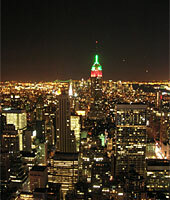 Find a hotel in New York during the New Year Celebration! There are hotels in the middle of Times Square, where you can stay and also have views over the festivities outside on Times Square. Just note that it is not certain that all the rooms have views in the right direction, but if you stay in any of these hotels you will have a big advantage to be able to get outside or to see the festivities from the inside of the hotel. Below we tip about three hotels. The annual four-mile midnight run in Central Park. 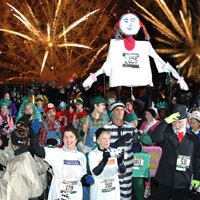 The four-mile Midnight Run in Central Park is a New Year's Eve event for fitness fanatics. There will be Live DJs and dancing, a costume parade and fireworks. The festivities begin at 10PM and the race starts when the clock strikes midnight. 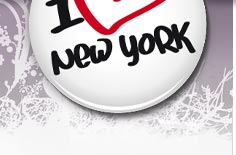 Popular events during New Year in New York! 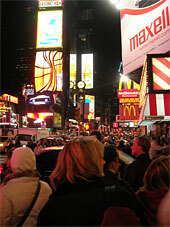 Images: www.timessquarenyc.org ("Countdown Entertainment, LLC") and own. With reservation for any changes and wrong writing.